A. Ingersoll, scratch built from pix. Even has gears. Genuine towing power for plane model. Neatly burried R/C with Vantec RET411P speed control. Virginia Tech. 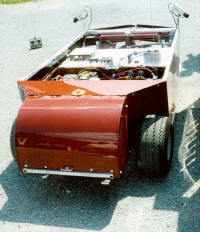 "Calvin" entered '96 autonomous competition and placed 1st. Vantec RDFR36E for speed control and an RET411P for steering. 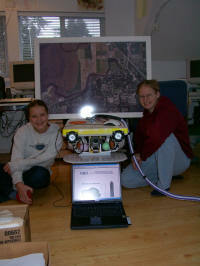 Peter Thain's kids did great (1st place in 2003) in the M.A.T.E. submersibe competition. No leaks. Yes, these bright Canadian's are pre-high school. Used Vantec RDFR23's, RET's and a Futaba Radio we set up for tethered coaxial operation. 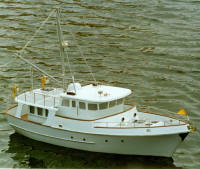 Captians Models - Example of custom builder Bob Kyle's work. Uses RET411P one after another. The Linda-Ann. Scratch built Tug. RET speed control. Note: Our products are not safety devices nor for use in life-critical or life support systems. Specifications and price subject to change without notice. Patented. Some trade names, trademarks & content owned by others.